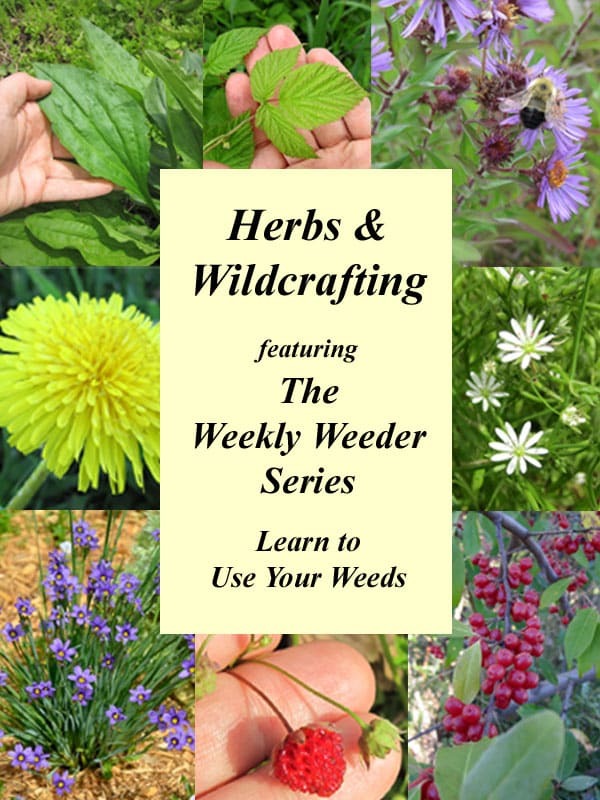 Welcome to the Weekly Weeder series, where we help you identify wild plants and how to use them. 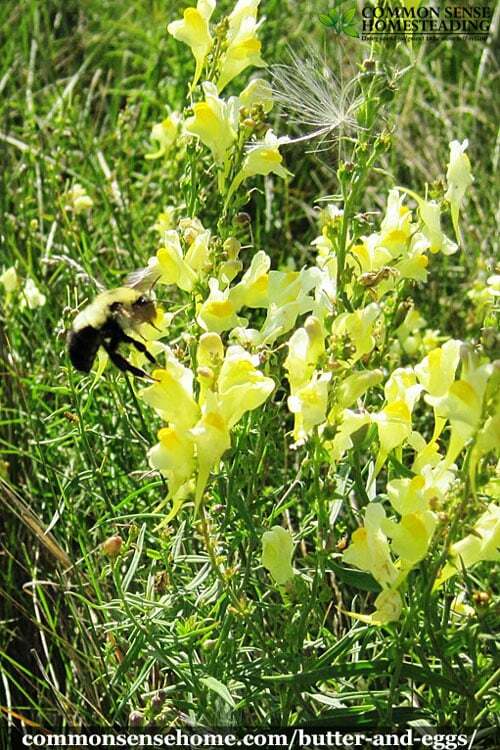 Today's featured plant is Butter and eggs, Linaria vulgaris. 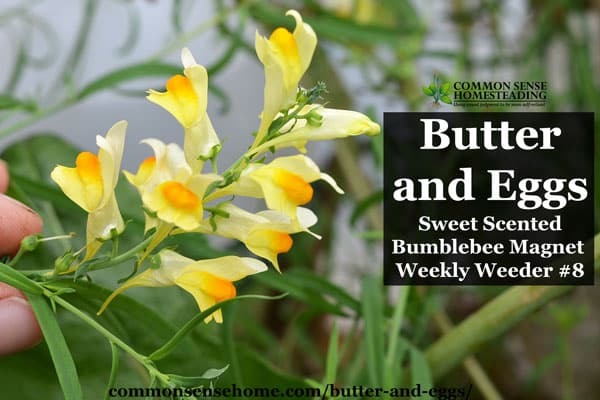 Butter and eggs is also know as yellow toadflax, wild snapdragon, flaxweed, bread and butter, false flax, brideweed, bridewort, Jacob's-ladder, rabbit flower, imprudent lawyer, pennywort and a host of other names. A European import, it has now naturalized over most of North America, including inside my greenhouse. Though less commonly used than many other herbs, it does have anti-inflammatory and diuretic properties. Where Does Butter and Eggs Grow? Butter and eggs originated in Europe and was brought over as a decorative garden plant. It escaped, and now ranges all over North America, from Manitoba to Mexico. (How's that for adaptability?) 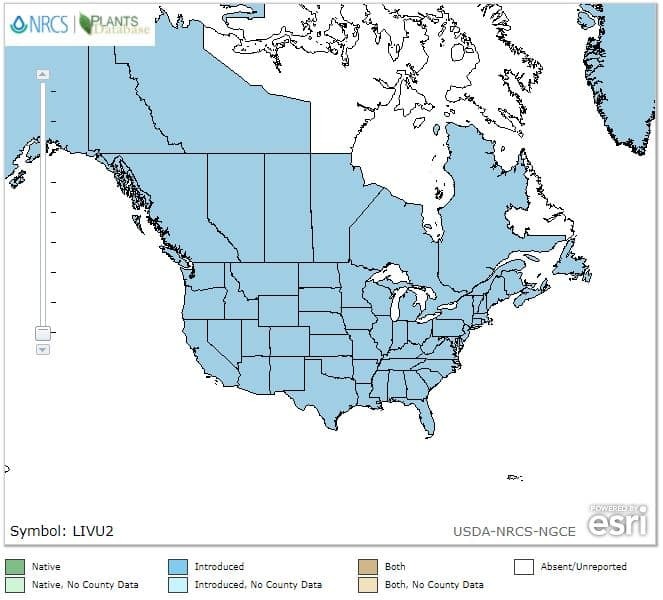 See USDA Plant Profile Range map for Linaria vulgaris below. 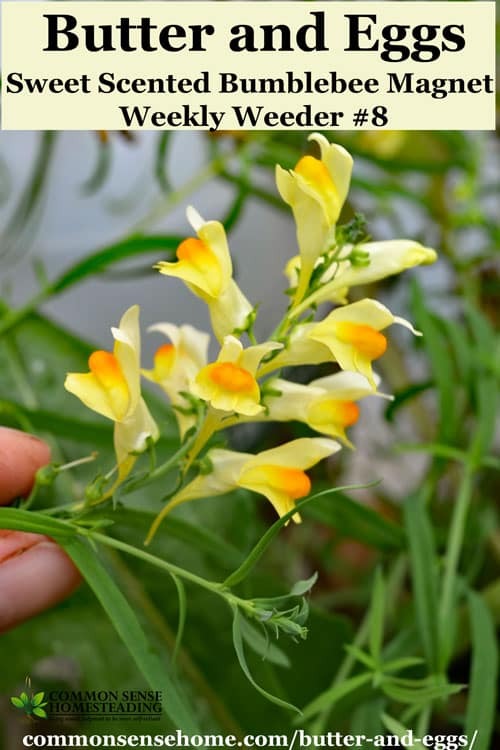 Toadflax is an aggressive grower, and can easily crowd out smaller plants. It prefers a neutral pH and gravelly and sandy soil, but can tolerate alkaline soils. Butter and eggs will happily grow in disturbed soils – along roadsides, in pastures, at the edge of woods and in your garden (or greenhouse). It's commonly treated as a noxious weed, because it is a perennial and spreads by rhizomes, plus the seeds can stay viable in the soil for eight years. It is commonly found in colonies, which offer bold blasts of yellow in the landscape. Butter and eggs pops in in my garden and near my mailbox, and we have extensive patches of it out in the pasture. I let it grow around the edges of the garden, but avoid letting it go to seed. Adapted from Wildflowers of Wisconsin. The flowers look very similar to Dalmatian Toadflax (L. dalmatica) but that species has broad leaves. The flowers are also similar to garden snapdragons, since both are in the Scrophulariaceae (Snapdragon) family. Flowers appear in spring, summer and fall. The aroma of the flowers is sweetly intoxicating. The flowers grow in spikes and have five petals. Each flower has yellow petals to the outside (butter), with an orange center (eggs). The orange part is known as a “honey guide”, which guides the insects along the long spur of the flower, insuring pollination. The height of the plant is between 1-2 feet. Leaves are grey-green, narrow and grasslike. They are attached directly to the stem, in an alternating pattern higher on the stem, and opposite or whorled below. Around here, the fields are humming with bumblebees working over the flowers of butter-and-eggs. Most sites I've seen dismiss it as a wildlife plant because it displaces native species, but I know the bees love the blooms. It's also a favorite of the hummingbird-like sphinx moth. Smaller insects are unable to effectively pollinate the flower because they lack the weight to open the bloom. Due to its glycoside content, the plant is mildly toxic to mammals and is rarely eaten. Adapted from Edible & Medicinal Wild Plants of Minnesota & Wisconsin. Note: As mentioned above, butter and eggs contains glycosides, which can be irritating and/or mildly toxic if consumed in large amount. Harvest the plant fresh and in flower. Do not exceed 2 teaspoons of dried plant made into tea per day taken internally. 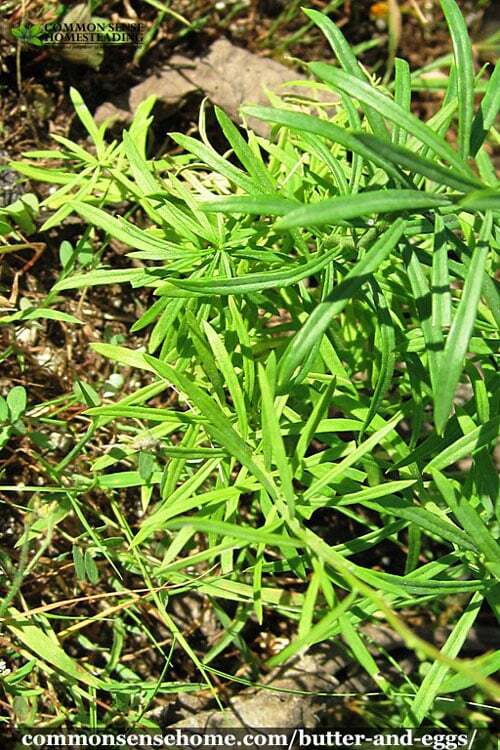 Historically, the herb has been used as a liver tonic, diuretic, eyewash (to reduce inflammation), constipation remedy (and ironically, to firm up diarrhea), and a hemorrhoid treatment. When used as a liver tonic, it is commonly combined with other hepatic herbs such as burdock, dandelion, yellow dock and red root. “Weeds” are just plants that grow without being planted – or where you may not want them – but they serve a purpose. I always tell the boys, “Nature abhors a vacuum.” If there is an empty niche, it will be filled. Our weeds hold the soil in place, plow compacted subsoil, draw up nutrients, provide medicine, feed wildlife (and people) – they are a treasure, not a curse. As you tend your yard and garden and the soil improves, unwanted volunteers will either disappear on their own, or be much easier to manage. Thanks so much for stopping by to visit. Help stop the overuse of herbicides by spreading the word about putting our weeds to work and sharing this post. Originally published in 2011, updated in 2017.
thanks for a great intro to butter & eggs. I went to my train station to bring back these plants to grow in my backyard. which is very clay type. i read somewhere else that this is invasive, but I do want the roots to go into the soil & break it up.. and then I hope to keep it under control. do you think thats; a good plan.. This looks like a plant that showed up in my herb bed and has sowly begun to pop up nearby. What I have makes it’s appearance as a short stalk with leaves radially arranged around the stalk. The stalk will grow over a foot tall before drooping. It spreads via rhizomes, a characteristic that I try to defend my annual beds from, so I have been pulling it asap, and can’t remember ever letting it get to the flowering stage. The more I garden in the Northwoods, the greater my respect for how tenacious these rhizome weeds are. They hold soil where there is not much soil to hold and keep it in place despite the frequent flooding. They survive our 2 foot-plus-frost-lines and return vigorously every year. It’s nice to learn this is another valued Old World herb with therapeutic properties. I MAY let it go in a patch and bloom so our pollinators can benefit. i have a little hope in my heart that my chickens can eat them, enjoy and benefit from them, now that I know it has therapeutic properties. Before I s\rt my Butter and Eggs patch, I do want to know whether feeding them to my chickens is a guaranteed way to spread this herb through that fabulous chicken manure? I love it when you pop your Weekly Weeder features into your blog, Laurie. Do you plan to add comments on suitability for the chicken diet? If there are seeds, I suspect at least some of them would survive the chicken system intact, but I doubt that they chickens would eat it in quantity due to the glycosides. There’s not a ton of information on weeds for chicken food out there, so I’m slowly testing things with our flock (avoiding those that have a high likelihood of toxicity). Thanks for letting me know that there is an interest. Well, I mention it because my juvenile chickens proved smarter than I regarding buttercups. I was not familiar with this plant, and liked the happy, bouncy bright yellow flowers so much that I let them spread all over the meadow new my cottage. Now that I have pastured chickens, I have observed that they know better than to eat it, but there is so much in some areas that they have quit scratching and nibbling freely and are eating far more feed than expected. When I realized this I started collecting the flowers before they go to seed, but I haven’t figured out if as members of the ranunculus family they are annual, bi-ennial, or perennial. In my new chicken farmer life, I am sincerely hoping for door #1. Here’s a start on whatever research you might want to pursue. https://novascotia.ca/museum/poison/?section=species&id=111 Oh, man, do I not want to weed hundreds of buttercups every summer for the rest of my life!!! Thanks for the link. Most weed seeds I’ve researched persist for years in the soil, simply waiting for the right conditions. It may be a challenge to get them under control, but overseeding with more desirable species may be a help. 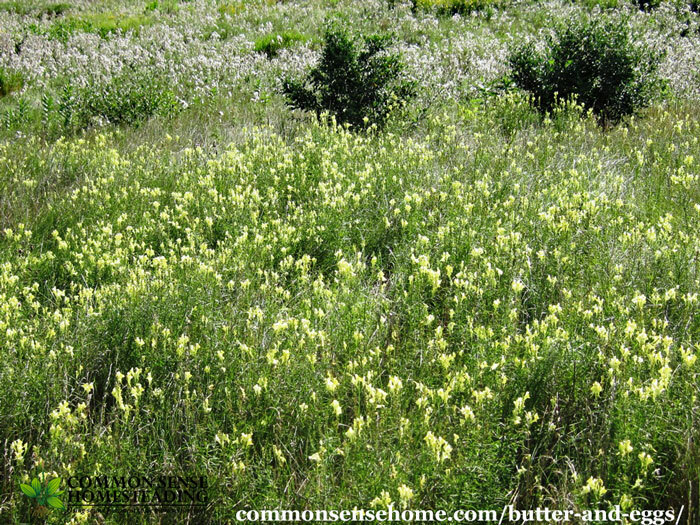 Butter and Eggs is an invasive species in our natural areas that out-competes native species and native food sources for pollinators and wildlife. I would recommend agains knowingly planting this species. Instead, check with your local natural resources and/or garden expert to plant native species.